Great, now we can have two emulators! One from you and one from RaichuBender (I think that was his name). Also, did you test it on O3DS or N3DS? It would be nice if it could run on both at a playable speed. I have been testing on a New 3DS. I can change the clock to the old 3DS’s speed of 268MHz through CFW, so I’ll be sure to keep you updated on the slower clock speed. I do have an old 3DS to test it but I’ll have to get smilebasic on there. -The GameBoy's games could be up to 8mb, which immediately uses up ALL memory SmileBASIC can use. -The GameBoy has 8KB of ram, which would most likely take up 32KB of SmileBASIC's memory. This could be reduced, at the expense of increased processor usage. -The GameBoy has 8KB of VRAM, which would most likely take up 32KB of SmileBASIC's memory, just like before. There are other things which would take up even more memory, but these are the main ones. A few things. First off, I'm not aware of any games which were 8MB, I just read that it could handle cartridges up to 8MB. Second, the only way to really use less RAM to store the ROM is to store the GB ROM in several DAT files, and load them into the ROM array whenever that part of the GB ROM is needed. I suspect if you were to try to do this you would quickly find that it wastes a lot of time loading. You could improve load times by loading several 32KB ROM portions at once, and by storing them together. I’m sorry, I’m not following what you are saying... I only have one array that contains all of the Gameboy’s memory. When you said save RAM, I though you meant that I should pack 4 bytes into each array index, since each number can be 32 bits in SB, rather than fitting one byte into it, put 4 bytes. Very excited to see this release be possible. I have one question: How are you going to handle ROMS? Will they just be transfered via SBMODEM? Keep up the great work! PS: Now I can play (or will be able to play) all my old GB ROMS on my calculator and 3DS! 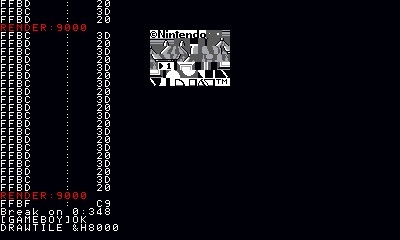 You said that not all of the GameBoy ROM is in SmileBASIC RAM at one time. In order for that to work you would need to split the DAT file containing the ROM into several portions, and save it as several separate DAT files. That way, you could have an array with 32768 elements, and load the ROM portions into that array as each part was needed. It's impossible to only load part of a DAT file. Does anyone understand what I'm trying to say? Ahh, I understand. So SB doesn’t reallocate the memory… I’ll have to think about how to handle the ROM. Woah... I hope this will work out well! Maybe I can load in ROMs with PetitModem? You could easily store all of the gameboy's 64KB of address space into SB's 8MB of RAM lol, even without packing multiple bytes into each array element. 256KB is just 3% of the RAM that SB has. -The GameBoy has 8KB of ram, which would most likely take up 32KB of SmileBASIC's memory. This could be reduced, at the expense of increased processor usage. 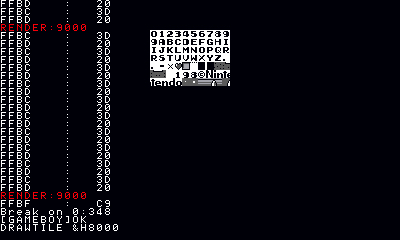 -The GameBoy has 8KB of VRAM, which would most likely take up 32KB of SmileBASIC's memory, just like before.